Loud noises can surprise the fetus. . . and us! 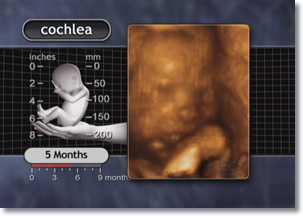 By 24 weeks, the eyelids reopen5 and the fetus exhibits a blink-startle response.6 This reaction to sudden, loud noises typically develops earlier in the female fetus.7 This response is very much like what adults and children exhibit in the same situation. 1 Weinberger et al., 1982. 97. 2 Lebenthal et al., 1983. 1. 3 Vitaterna et al., 2001. 92. 4 Okai et al., 1992. 392. 5 Andersen et al., 1967. 293; Campbell, 2002. 3; O'Rahilly and Müller, 2001. 465. 6 Birnholz and Benacerraf, 1983. 517; Campbell, 2002. 3; Drife, 1985. 778. 7 Lecanuet and Schaal, 1996. 9. 8 Visser et al., 1989. 285. 9 Petrikovsky et al., 1993. 548-549. 10 Gerhardt, 1990. 299; Pierson, 1996. 21, 26; Petrikovsky et al., 1993. 548-549. 12 Davis ME and Potter E, 1946. 1199. 13 Natale et al., 1988. 317. 14 Connors et al., 1989. 932.